It has been almost two years since I was last at Maze. It was my birthday and I was taking my dad out, and the whole meal was OK, nothing more. A lot can change in the space of two years, and in the case of Maze, a lot definitely has. Executive chef Jason Atherton has left to open his own restaurant, and the focus of the menu seems to have veered away from the sharing element. I was invited by the PR team to try out the new unusual pairings menu involving drinks from all around the world, paired to the chefs menu (at the chefs table no less). Ever thought about pairing a bubbly sake with crab? How about a whisky based beer with lamb? Yeah, me neither but those were amongst the two pairings that we tried. I have never claimed to know a lot about drink, but I was genuinely intrigued by our sommelier who provided a detailed background behind each drink, as well as explaining why he thought that they would pair well with the food we were about to eat. Really fascinating to hear about the origins of certain drinks and how they came about. On the whole, the pairings were successful and it was fun trying out some new and interesting drinks. Not everything matched that well in my eyes, but I guess that is just a matter of opinion. The food was probably the most surprising part for me. The chefs menu contained lots of contrasting flavours and textures, and as a menu, was extremely well rounded. Favourite dishes were a velvety cauliflower velouté paired with a bubbly glass of Nyetimber, and a delicious lamb dish which came with the most intensely flavoured roll of lamb shoulder and sweetbreads, paired with the rather fine Innis and Gunn bourbon cask beer. The highlight came in the shape of a late harvest mourvedre dessert wine, packed to the brim with the flavour of wild berries and actually made with raspberries as one of it's key ingredients. 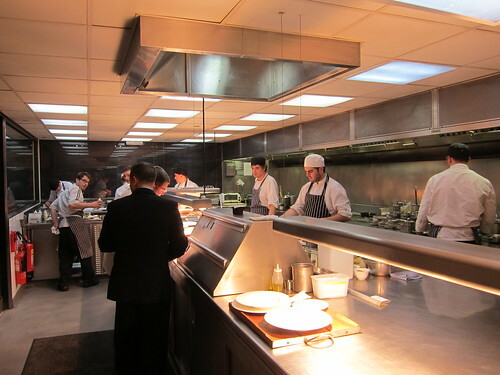 In amongst all the eating and drinking, we also had the opportunity to have a look around the vast kitchen. I have been lucky enough to check a few other Michelin starred kitchens and this is by far the biggest I have ever been in. A few of us even got a chance to cook some fish (cooking our own dinner as such) and standing near the stoves, you can really get an idea of the heat that the chefs have to battle on a daily basis. 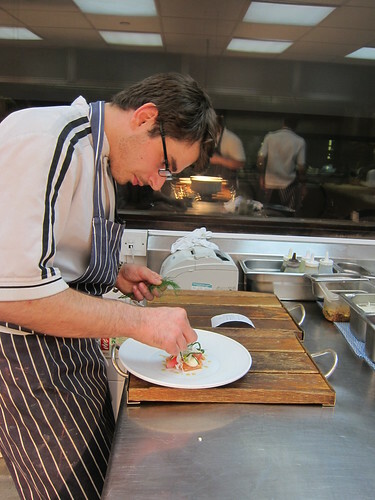 Alex Marks, the new head chef, stood at the pass and made sure that every dish that went out was exactly to the same standards as the last. 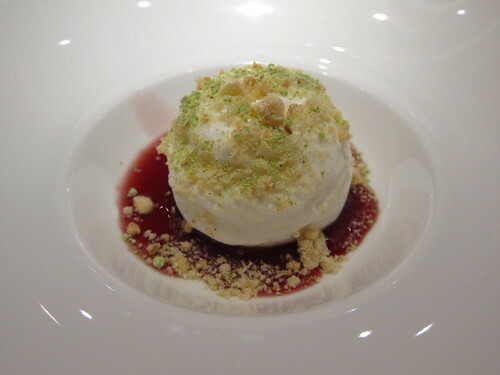 The meal ended as it began, with a superb take on a blackberry and apple crumble (blackberry sorbet surrounded by some apple mouse and showered with a few little crunchy bits). The whole meal had been incredibly enjoyable and I am not ashamed to admit, I was pleasantly surprised. My first meal here had hardly filled me full of joy, and I guess things can go either way when a high profile chef like Jason Atherton decides to move on. I certainly enjoyed my meal, and on this example, you probably will too. Still pack a pretty damn hefty punch, price-wise. The food does sound good, but would it be just ok without the interesting pairings? 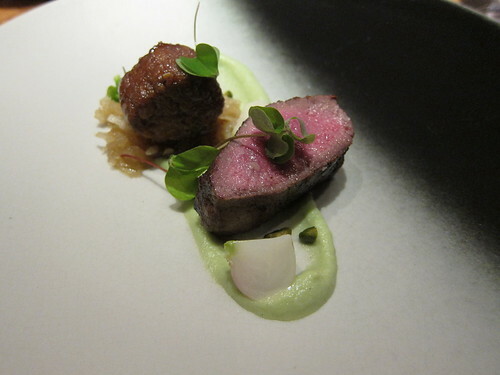 @ Pavel - That roll of shoulder was one of the best things I have eaten this year! @ Lizzie - I agree that it's definitely not cheap, but the food was much better than I had in the past. I think the menu would be just as enjoyable without the pairings, they were just a nice interesting addition.